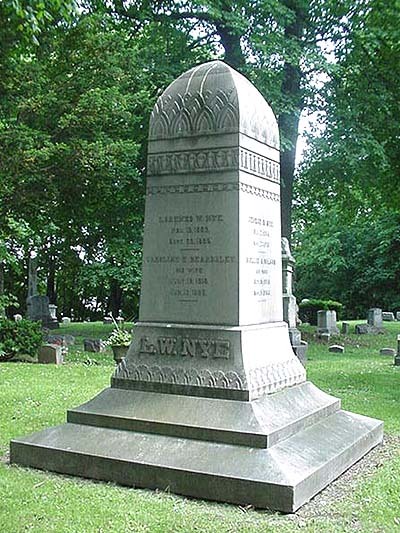 Born in Auburn December 2, 1854, George Hyatt Nye was President of the Cayuga County National Bank from 1896 to 1916, although he may be more readily associated with the Nye & Wait Carpet Company, where he was President and Treasurer. George married Mollie Wilson (1858 -1904) of New York City in 1881 and they had six daughters and one son; Frances, Caroline, Jean, Maud, Mollie, Katherine, and George H.
Frances (1883-1946) married William K Payne, an attorney and son of Sereno Payne. Caroline married Lyman Rhodes of New York City, a banker. They established residence in Sharon, Conn. where two daughters were raised. Jean (1888-1956) married David Wadsworth III and she operated the Wadsworth & Son Scythe Company after David's death in 1923. Maud (1889-1963) married H. G. Metcalf. .
Mollie (1890-1930) married Bryan Wait, the son of William F Wait (W. F. Wait was vice president and general manager of Nye & Wait Carpet Company). The house of George Nye and his wife Mollie still stands on Melrose Road. The people in this photo are the Letchworth family, who may have owned the house prior to the Nyes. There is at least one reference that Judge Conkling originally built the house. The Nye Wait Carpet Company was located at 11-19 North Division Street. The original company was Carhart and Nye, founded in 1852 by George's father, Lorenzo W. Nye (1808-1885). It was one of many factories located along the Owasco Outlet to take power from the dams and waterfalls. Lorenzo was married to Caroline Beardsley, daughter of John Beardsley. Lorenzo and Caroline Nye lived at 70 South Street. In 1816, Elijah Miller and John H Beach built a large cotton mill at the falls on North Division Street. The mill went through various hands until it was bought by Lorenzo Nye in 1853. It burned in 1869 and was rebuilt and enlarged by Nye as a woolen carpet factory. The partnership of Nye & Wait was formed in 1871, at which time the works consisted of a four story stone and brick building perpendicular to the Owasco Outlet containing the spinning and weaving shops and the power house. The Nye & Wait company closed in 1969. These two photos are from 1890. The American Axminster Industry later became the Firth Carpet Company. Those buildings still stand on Columbus Street. 'Axminster': NOUN: A carpet with stiff backing and a soft, colorful cut pile usually arranged in a complex pattern. ETYMOLOGY: After Axminster, a town of southwest England. The Nye family lot is in the Cemetery's Council Ground section. This uniquely sculpted stone was produced in Hartford, CT.
Click here for more on George Nye, William Wait, and the Nye Wait Company.